This building is a serious concern to Airbnb. 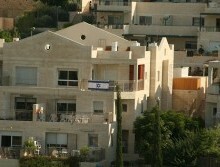 Home in Ma’ale Adummim Settlement in Judea and Samaria region. Illustrative. Photo by Joshua Spurlock. Airbnb on Monday announced via press release a new policy on listings in “disputed regions.” In a world of options, they chose just one location in which to enforce a new ban on who can list their homes for rent on the space-sharing website: the Biblical heartland of Judea and Samaria. And while Jews and Arabs live in that area, Airbnb chose only to remove approximately 200 Israeli settlement listings from their site, which allows everyday people to list residences on the website for rentals. While Airbnb’s statement on their website claimed they hold “deep respect” for the various views on the region Arabs call the West Bank, Israeli leaders saw the move as the exact opposite: anti-Semitism. Michael Oren, former Israeli ambassador to the United States and now a member of the Israeli Knesset (parliament), slammed on Twitter the one-sided nature of the Airbnb decision. “Airbnb blacklists Jewish apartments in Judea and Samaria—not Palestinian apartments, not apartments in Turkish occupied Cyprus, in Moroccan occupied Sahara, not in Tibet or the Crimea. Airbnb’s policy is the very definition of anti-Semitism. No one should use its services,” tweeted Oren. The center of the controversy is a slice of territory claimed by both Israel and the Palestinians. Captured by Israel during the defensive Six Day War in 1967, the region is now home to hundreds of thousands of Israelis in large cities and tiny towns alike. It is also home to famous Biblical sites such as Hebron, Bethlehem, Jericho, and Shechem. Israeli Minister of Tourism Yariv Levin felt similarly to Oren, with a press release from his office calling Airbnb’s move a “discriminatory… disgraceful and miserable decision.” He further accused the company of a “disgraceful surrender,” and it appears the move was at least partly based on pressure from organizations historically critical of Israel. Airbnb’s press release portrayed the decision-making process as them having “wrestled with this issue,” the aftermath of “considerable time speaking with various experts” and resulting in a multi-prong test for when to ban listings in “disputed regions.” However, pressure from the liberal organization Human Rights Watch—which was set to release a report slamming the listing of homes in the area the next day—was also a key factor. Just ask Human Rights Watch. Human Rights Watch’s Israel and Palestine Director Omar Shakir tweeted, “Breaking: after 2 yrs of engagement & day ahead of release of 65pg @hrw/@KNavot report,@Airbnb says it’ll stop brokering rentals in illegal Israeli settlements that effectively bar entry to Palestinian ID holders.” Shakir’s tweet conveniently left out the reason for intense security in Israeli settlements, where Palestinians have launched multiple brutal terror attacks against Israeli civilians over the years. For Israel’s Tourism Minister Levin, his office’s response to Airbnb’s decision is to effectively say that two can play the blacklist game.